If service providers aren’t prepared they could face not being able to carry the huge levels of traffic required by the host application to any and all of its possible destinations. Noise about 5G is certainly getting louder, with predictions that by 2025 the number of worldwide connections is set to hit 1.4 billion. As demand for services and applications increase, service providers are struggling to keep apace – the industry has yet to fully implement a working and reliable 4G experience for users – which begs the question: how can operators monetise 5G sufficiently and provide the end user with the customer experience they demand? The explosion of mobile data over the past 5 years has taken the overall global figure to around 3.7 exabytes per month. In 2015 alone, mobile data increased by 74 per cent. The growth of streaming services, such as Netflix, and consumer’s growing use of apps – all underpinned by the expectation of having a high-speed data connection at all times - is behind this demand. 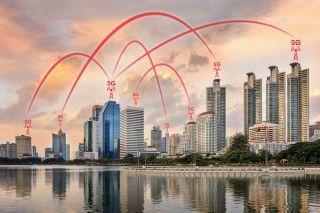 Consumers now expect to be ‘connected’ and the proliferation of multiple connected devices including self-driving cars and delivery drones are driving this trend, putting pressure on service providers to take the lead in the race for 5G. Similarly, 5G’s support of IoT is another key driving factor for its high demand; after all, Gartner estimates that the amount of connected IoT devices will reach 26 billion by 2020. From wearables to internet connected things, such as smart meters, it is hoped that 5G networks will be faster but also a lot smarter, enabling them to cope with the increase in user demand. Three claims that it is ready to implement an overhaul of its network, which is likely to cost hundreds of millions of pounds per year over several years, to meet the demand for data as it prepares for 5G to be introduced. Despite this data ‘demand’, there is still work to do in identifying the right business models and revenue opportunities to monetise 5G roll out. With 5G theoretically 40 times faster than the hypothetical limit of 4G, it will take a great deal of expensive upgrading of the current infrastructure to fulfil its claims. Implementation of 5G will be vast and although progress has already been made, making roll out a reality by 2020 presents immediate infrastructure challenges to the industry. It is evident that the infrastructure overhaul will be huge – and expensive. The 5G roll out will require the current mobile networks to be more wired and the applications running on 5G need not just high bandwidth but low latency. Similarly, service providers must ensure have the correct protocols in place to unlock the potential of 5G. They will need to ensure they have an effective Stream Control Transmission Protocol (SCTP) solution in place for Diameter signaling. As implementations begin to roll out, the growth of Diameter will continue to accelerate so the need for a good transport layer should be a priority. If service providers aren’t prepared they could face not being able to carry the huge levels of traffic required by the host application to any and all of its possible destinations. With this expensive upgrade in mind, will consumers be willing to pay more for 5G data to support this and if not, how will operators pay for this new infrastructure? There is no clear plan as yet as to who will pay for this or how 5G roll out can be monetised. If you look at the traditional business model, the service provider makes money from the subscriber, which the service provider then invests in new equipment and services. Yet, there is a danger of this chain being broken with 5G rolling out. Service providers cannot guarantee that they will make money out of the subscriber because they are not developing the new services for consumers to increase revenue. If service providers are going to play the long game, they have to understand where that monetisation can come from. If they get it wrong, it precludes them from making money further down the line. We have all experienced issues with the current 3G and 4G networks. The industry has not fully utilised the technology yet, so the move to 5G isn’t necessarily going to be a smooth as some might think. It could be said that, at this point in time, users just want a good, reliable service. Do they really care if that service is delivered by 4G, 5G or XG? If not, then why would they be prepared to pay a premium for 5G service? It is, therefore, vital that service providers have the right infrastructure, monetisation strategy and tools in place for 5G to be successfully implemented to deliver the right experience for consumers. If we are to believe recent reports that every European town, city and village will deploy 5G networks by 2025, then service providers will have their work cut out to provide a high level of service that end users have come to expect in recent years – as well as deep pockets. Despite all this talk of 5G, there is still a lot that can be done to improve current 4G networks. Research from consumer watchdog Which? found that the rest of the UK is lagging behind London when it comes to accessing 4G data services. Therefore, service providers should focus on developing a strong 4G service for subscribers and not believe the 5G hype coming from OEMs who are desperate to develop new handset features that will require 5G capabilities. Service providers will need to have this front of mind when learning how the current 4G network can work alongside the development of 5G. In doing so, not only can they keep up-to-date with modern-day user demands, but also protect and improve their investment in 4G. Although the telco industry has the challenge of keeping up with end-user demand and keeping eager 5G equipment manufacturers at bay, the focus should remain on ensuring that 4G works sufficiently before the industry turns its attention to the much mooted 5G.